We don’t have to travel far to see a BIG Christmas lights display. Right here in the Hudson Valley, the Gay family of Union Vale, NY puts on an incredible show every year in their front lawn. It’s not just any lawn, and it’s not just any light display. 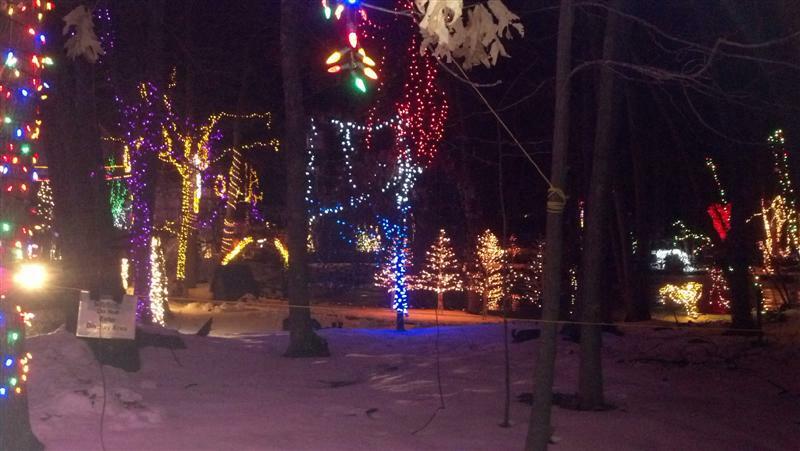 The ERDAJT light display (the name includes the initials of the family’s three kids) began on a much smaller scale in 1995, and has grown to now include 392,887 lights. They are strung up on trees, fences, poles, and suspended in air. Big lights, small lights, blinkers, solids, strobes, colored and white. Any kind of light you could ever imagine. 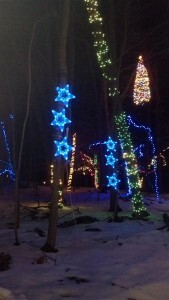 The newest elements include: three “Leaping Light” trees towering 50 feet high, each with 15 channels and 7,000 lights. 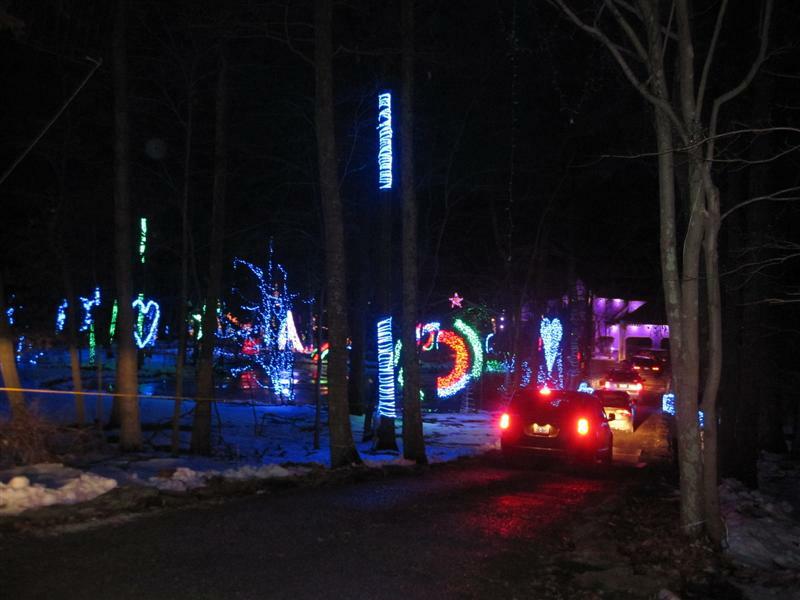 Last year, the family earned a Guinness World Record for the most lights on a residential property. Most are LED’s, so the estimated electric cost is only about $350. They use some 2,000 extension cords, or about eight miles worth. And what’s more, they pulse and blink in different areas to the beat of music, which is piped through a radio channel, so you can listen in your car! The soundtrack they created includes 181 songs, a mix of holiday classics and rock. 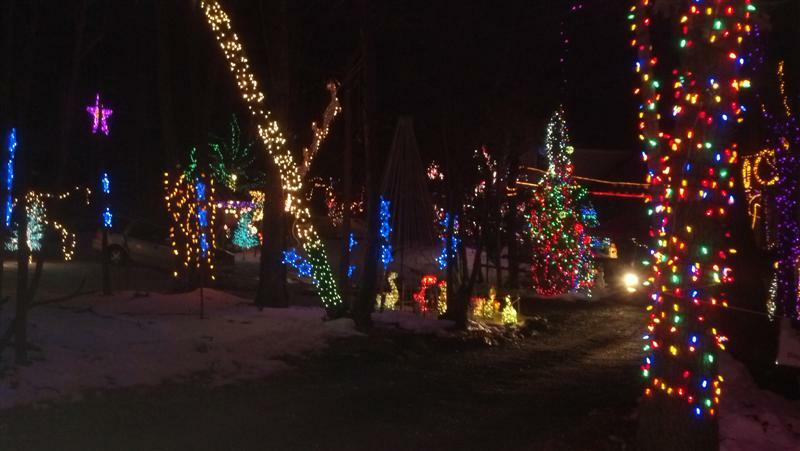 The family graciously allows anyone who wants to enjoy the show to drive their circular driveway around the heavily wooded lawn, which includes a pond in the center. Even better, they accept donations, which are given to charitable organizations. This is a video snippet that Matt the Multi-tasker took from his driver’s side window while driving through. Kids, don’t try this at home. Still, I can only imagine what the neighbors must think! Clark Griswold had nothing on this house. That is awesome! What a great light display! I love your family trips, not only do you get great content for this blog, but your children are enjoying themselves, and you’re making lifelong memories. Do you guys always plan your trips in advance? Have you ever decided to make any last minute trips? Perhaps a road trip to somewhere? Hi Robert! We pretty much always plan our road trips in advance, because it pays to get the kids on board and excited about where we’re going. We try to give them choices on the itinerary, so they feel invested in the trip too. Occasionally though, we’ll do a day trip and not tell them where we’re going. That’s fun too! I love your pictures. It looks like a beautiful place! That’s awesome, That’s the way to celebrate Christmas..